There are plenty of seemingly odd pairings that actually go really well together. Bacon and peanut butter. Bourbon and pickle juice. Sonny and Cher. However, you've probably never considered how compatible red wine and coffee are. Thankfully the folks at Apothic Wines did, and they're now introducing a cold brew coffee-infused red wine, allowing you to get your fix of two delicious vices in one fell swoop. Errr, sip. 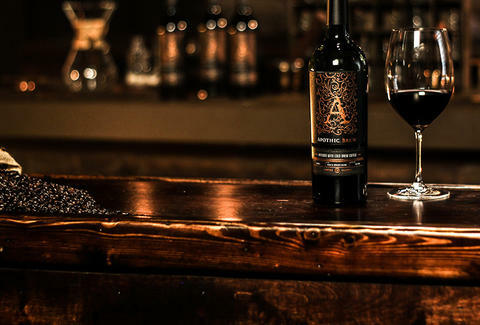 The new vino, aptly named Apothic Brew, is a limited a release from the California-based vintners and made by infusing a dark red blend with actual cold brew coffee. Besides boasting notes of coffee, Apothic describes the flavor as evoking both red fruit and toasted oak. And while you might expect it to pack the jolt of energy you might get from a morning cup o' joe, it actually contains less caffeine than a cup of decaf (so no, this isn't a more sophisticated replacement for Vodka Red Bull). The unique boozy blend is "a response to the growing demand for cold brew coffee in the United States, which grew a staggering 430% between 2015 and 2017," Apothic said in a press release. They recommend serving it either at room temperature or slightly chilled. Bottles will hit shelves in limited quantities starting April 1, and you can scope out where to find them near you on Apothic's website. Just don't expect it to stick around too long.